After giving the Crucial BX500 960GB a clean format and ensuring alignment and everything is correct, I fired it up for some testing in HD Tach. While HD Tach is more of a drag race than a clear indication of real life performance, and has been around for a really long time, it is an excellent storage performance reference among SSDs with the same controller and has been our favorite benchmark long before hard drives even cracked the 50MB/s mark. 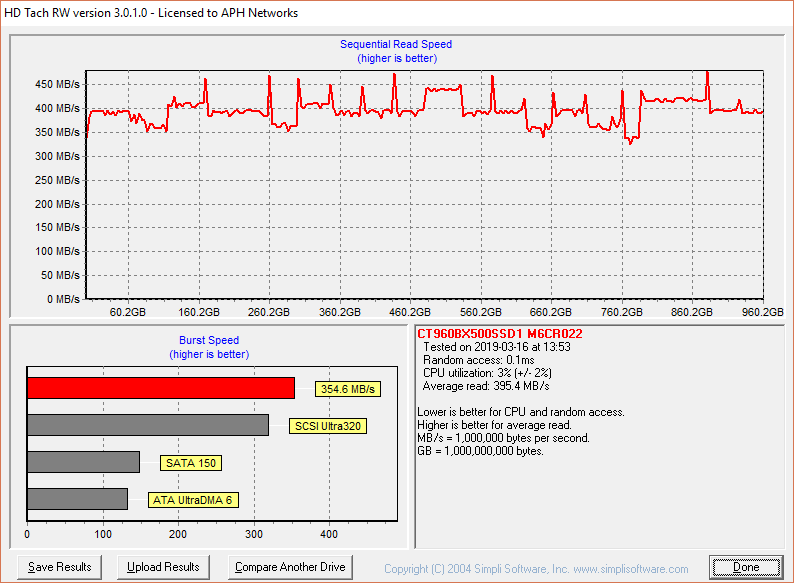 With an average read speed of 395.4MB/s according to HD Tach in single disk configuration, this score is not bad, but a big step back from the BX300's 475.7MB/s. It was, however, slightly ahead of its 480GB variant's 383.1MB/s score. For most solid state drives, we typically look for something that is faster than 350MB/s. From our experience, most drives do not crack the 400MB/s line. At the end of the day, HD Tach may not be the best test for solid state drives all the time, but these results are always interesting to look at. posted 4 hours and 3 minutes ago, with 1 posts. posted 4 hours and 4 minutes ago, with 2 posts. posted 4 hours and 4 minutes ago, with 8 posts. posted 4 hours and 4 minutes ago, with 7 posts. posted 4 hours and 5 minutes ago, with 7 posts. posted 4 hours and 8 minutes ago, with 15 posts. posted 4 hours and 9 minutes ago, with 59 posts. posted 4 hours and 9 minutes ago, with 14 posts. posted 4 hours and 9 minutes ago, with 11 posts.